Aufgerundete 4 Sterne für dieses sehr erfolgreiche Brit-Soul-Album von 1989. 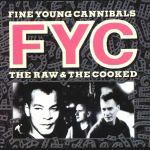 For my opinion, Fine Young Cannibals are pretty much a decent UK rock band from the late 80's and yet this album became a medium listen for me. "She Drives Me Crazy" is my jam but not too favorsome on "Good Thing" though. The rest of the tracks are pretty much in a 7 sharp score. I'll say I'm Not The Man I Used To Be, Tell Me What and It's OK (It's Alright) killed it on this album with 10 out of 10 to round up. However, there are some strange choices when you soon hear throughout with 10 songs and what I mean there is some irritating freaky electronic noises (Particulary on Don't Let It Get You Down). And most of all, it didnt felt rock to me. More like showing a bizzare image of dance pop. Plus the FYC lead singer's voice is middling at times. But overall I would like to listen this again.